The information sent to the mixed commission by the Brazilian Police refers to the construction of the Roboré-El Carmen highway, delivered in 2009 by Evo and Lula. The Brazilian company Camargo Correa distributed $4.3 million dollars in 51 payments in Bolivia, to be favored with contracts for the construction of the Roboré-El Carmen highway, according to the report sent by the Federal Police of Brazil to the mixed commission that formed the Legislative, to investigate the scope of the Lava Jato case in the country. 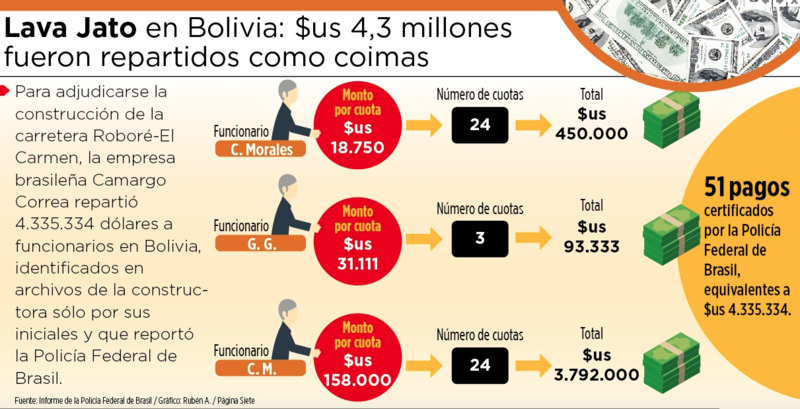 The official document states that the money delivered by the construction company reached recipients identified with the initials C. Morales, C. M. and G. G., who benefited from the payment of 51 installments (see infogram), which were certified by the Brazilian authorities. The Roboré-El Carmen road section began its procedures and execution in the efforts of the presidents Carlos Mesa and Eduardo Rodríguez Veltzé, but was completed in 2009 during the presidency of Evo Morales. In the case of C. Morales, it was certified that he received 24 installments, each of $18,750 dollars, which completed a total of $450,000 of the foreign currency. Based on the file sent by the institution of the order of the neighboring country, the bribes would have been paid until August 2006, when Evo Morales was already the President of the State. Something similar happened with the subject mentioned in the documentation as C. M., who received $3.7 million dollars, in 24 installments of 158 thousand dollars each, as required in the report of the Federal Police. In the case of GG of the SNC (National Road Service), the legislators that make up the mixed commission suspect that it may be an official, although the initials could also refer to the General Management of the SNC, which received $93,334, in three Camargo Correa payments. The information sent from Brazil is part of the operation called Castillo de Arena, whereby the Federal Police, since 2008, investigated senior executives of Camargo Correa, who carried out works in 40 countries in Africa, Asia and Latin America. With the first signs of illicit activities, the federal court that followed the case authorized the “pinching” of the phones of three high civil servants of the construction company, among them Pietro Giavina-Bianchi, who finally contributed data on amounts and recipients of the bribes. The file of the Brazilian Police includes 280 pages, in which the “payments to Bolivia” appear 17 times, along with mentions to the Roboré-El Carmen highway. The section in question has an extension of 139.2 kilometers and required an investment of $97,156,407 dollars, financed in part with the PROEX of Banco do Brasil and the Development Bank of Latin America (CAF). President Morales and former President of Brazil Luiz Inácio Lula da Silva inaugurated, on January 15, 2009, that highway and the El Carmen-Arroyo Concepción route, awarded to Odebrecht; both companies were investigated in Brazil and other countries by the Lava Jato case. Its chief executives were prosecuted. Legislators of Democratic Unity (UD) and the Christian Democratic Party (PDC) are part of the opposition’s parallel commission, which will investigate the alleged payment of bribes from the Brazilian construction company OAS to Bolivian officials and their links to the Lava Jato case. The parallel commission is made up of Arturo Murillo, Yerko Núñez, Edwin Rodríguez, Trifonia Muñoz, Shirley Franco and Lourdes Millares, on the part of UD, and Jhovana Jordán of the PDC. “We have given ourselves six months to present our report to the people of Bolivia. The Constitution obliges us to monitor any suspicion of corruption and the difference with the masista commission is that we will cover all travel expenses, hotels and others that arise,” Senator Arturo Murillo told Página Siete. The UD lawmaker said that last week he traveled to Peru, where he met with officials who carried out investigations into the Lava Jato case. “On Friday I have been in Peru, where I have met with a group of people who, with their investigation, have imprisoned (Ollanta) Humala and have carried tests in other cases. They explained to me all the forms of research they have used and all the channels that can be used to get information,” said Murillo. Senator Yerko Núñez explained to this newspaper that the commission will emphasize the contracts signed between the State and OAS, because it is one of the companies involved in the Lava Jato case that signed more contracts in Bolivia during the administration of President Evo Morales. “It is not appropriate for OAS to be out of the investigation. There is an intention of the Government to do a half-hearted investigation. You have to request information from authorities in other countries to include construction companies and consultants that have had a relationship with Lava Jato,” he said. Núñez clarified that the work of this commission is supported by article 151 of the Political Constitution of the State, which calls on the assembly members to carry out audit work, and stressed that the respective groups will cover their expenses. The deputy by Democratic Unity (UD) Fernanda San Martin Carrasco met Tuesday with her Peruvian counterpart Rosa María Bartra Barriga, to learn about the investigations carried out in the neighboring country on the Lava Jato case. The meeting was held in the city of Lima and was aimed at the “exchange of good practices to develop investigations of undue or irregular technical and/or administrative procedures associated with the contracting of public works”, according to Yerko Ilijic, legislative advisor of UD. Deputy Bartra chairs Peru’s Special Multiparty Commission, in charge of investigating the alleged bribes, kickbacks and gifts that public officials from different levels of government have received, in relation to the concessions of works awarded to Brazilian companies Odebrecht, Camargo Correa, OAS , Andrade Gutiérrez and Queiroz Galvão. Of the five companies that are investigated by the multiparty commission of Peru, four were awarded works in Bolivia, although only two are part of the investigations carried out by the mixed commission of the Legislative. In addition to San Martin, Senator Arturo Murillo also met with Peruvian legislators who participated in the Lava Jato investigations and announced that the parallel commission will go to Brazil to gather information related to Bolivia. In the case of the official legislative commission, a period of 180 days was given to deliver a first report of its investigation to the Plurinational Assembly. This entry was posted in Bolivia, Business, Politics, Social Unrest and tagged bad politics, corruption in public office, demagogue. Bookmark the permalink.